I was on the road last weekend and Tilted Duster is just too big to drag around on airplanes these days. I opted to bring my long mouldering Montego Bay Scarf. The yarn I’m using is a luscious and gorgeous Buckwheat Bridge Angoras variegated yarn. It’s a combo of 60% cormo wool and 40% angora, so the dye takes beautifully to the mohair and the cormo is super soft. Yummy. The scarf pattern is easy and mindless, pretty good for traveling or tv watching and goes really quickly if you actually knit on it, rather than stuffing it away in a zip-lock bag. 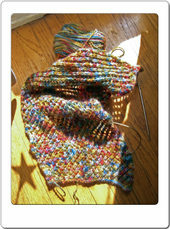 I’m using 39 stitches and #5 needles, so I managed to knit up about 10 inches without even trying. Nice.